© 2014 by Theo Schmidt; all rights reserved; content may not be copied, rewritten, or republished without written permission. If weve learned anything from the winter weather in 2013 and 2014 it is that unexpected storms can happen in any place, at any time. It is important to make sure that in these situations you, your family, and your home are all prepared to handle the freezing conditions. Ideally youll want to prevent your home from falling victim to frozen pipes in the first place. The phrase frozen pipe can be deceiving because it is not the pipe itself that is frozen, but the water inside it. When the water freezes it expands, cracking the pipe and allowing water to burst through. To prevent freezing in outdoor pipes, always remove garden hoses before winter begins. If possible, shut off the valve for water to these pipes. 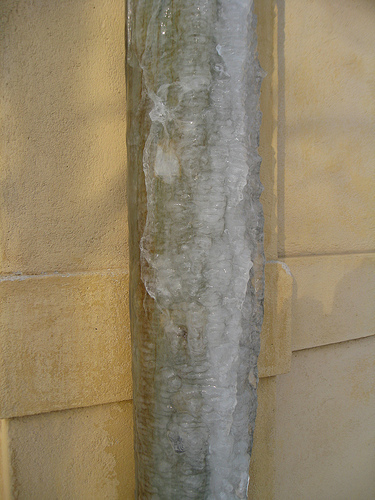 Failing to do so leaves water in the pipes that can easily freeze once temperatures drop. For indoor pipes, the main concern comes when you leave your home for an extended period of time and water isnt periodically running through the pipes. If you are leaving your home for more than a day or two, keep the temperature around 60 degrees Fahrenheit to prevent freezing. Additionally, leave cabinet or cupboard doors open to let air circulate around pipes and keep them warm. When you return from a vacation it is important to make sure that your pipes are all still working properly. A pipe covered in frost is a good sign that it is frozen. However, not all of your pipes will be visible to inspect. Where can you locate pipes? On a concrete slab foundation look for them in the attic secured to the ceiling joists (trusses/rafters). If you have a basement or crawl space, thats a good place to look. Of course you will have risers inside the walls where the plumbing fixtures are. Run water in your kitchen, bathrooms, or anywhere else you might have a sink. If the water pressure is unusually low or doesnt work at all, this is a signal that the pipe is likely frozen. If this is the case, shut off your main water valve immediately to prevent water damage should the pipe burst. If the pipe has already burst, still shut off the main water valve right away and then proceed to dry out your possessions as best as possible to prevent mold and mildew. For a large pipe burst or a hidden pipe, call a reliable plumber in your area. Need a Plumber? Find local unbiased reviews on the best plumbers in your specific area - Try Angies List . Even plumbers in warm places like Miami can handle frozen pipes as well as those who work in plumbing in Mississauga, Canada. And with global warming (climate change) happening around us, thats important! In the case of a burst pipe, it is important to repair the cracks before thawing the rest of the pipe. Sometimes circumstances will not allow you to fully repair the pipe at the moment so you will have to make do with what you have. Typically using pipe clamps is a quick and easy solution for burst pipes. If you are unsure of how to repair your pipes, it is better to call a plumber than making the matter worse on your own. Once you have identified a frozen pipe and fixed any cracks, it is important to thaw the pipe so that no further damage is done. The location of the pipe will help you determine the best thawing method. However, you should never use fire or a blow torch to thaw a pipe. The risk is greater than the convenience that comes with the instant heat. For pipes that you cannot see, you will likely need to make a cut in the wall to access the pipe. If you do not want to have to deal with repairing a wall as well, you can try to thaw the pipe simply by turning up the heat in your house. If this does not work, you will need to get direct access to the pipe and use an infrared lamp, portable heater, or an extra large heating pad to thaw the ice. For more accessible pipes a quick solution is using hot water to thaw them. Wrap a towel or burlap around the pipe and place a bucket underneath. Then pour hot water onto the pipe and repeat until it is thawed. As you are thawing your pipes, make sure the water is turned on so that the water pressure can help to thaw the pipes as well. Only do this though if you are sure there are not any remaining cracks. In a freak snowstorm or below-freezing temperatures youll have enough to worry about without dealing with a frozen pipe. Instead of risking the thousands of dollars in water damage and the emotional turmoil, prevent frozen pipes as much as you can ahead of time. Having one less concern will make your winter a little more tolerable. Theo Schmidt enjoys spending time in the outdoors and is passionate about protecting the environment. He is always looking for ways to improve his own home and relies on Advanced Plumbing and Drains for help. Did you find this article helpful? Thanks for supporting this free site with a small donation! Do you need an article or blog post written and featured on one of our sites or yours to promote your business? Hire Me!